The LG V40 ThinQ has leaked in a so-clear-it-looks-official image that reveals the smartphone's fancy new triple lens rear camera system and more. Previous leaks had pointed towards a notch display and a triple lens camera appearing on the LG V40 ThinQ and now a new leak from reliable leakster Evan Blass supports those rumours. The image shows off the phone in a typical press shot layout suggesting this is the real-deal and is what we can expect to see at the October 3 event LG is holding. 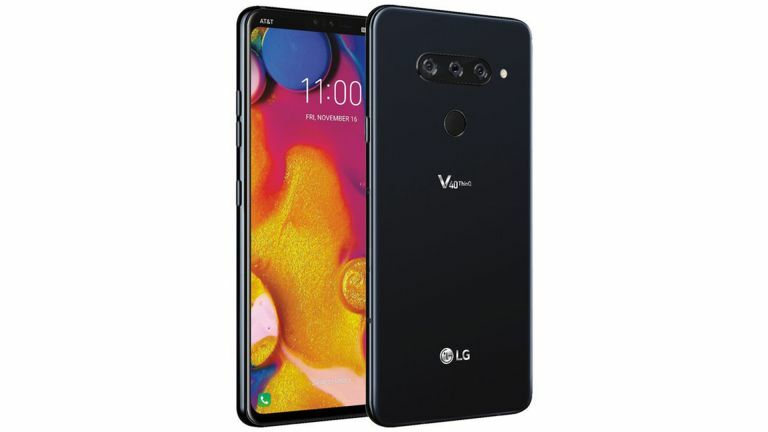 The LG V40 ThinQ is expected to be available to own from November 16 and if it's similarly priced to the V35 ThinQ you'll pay around £700 to own one. Rumours are shaping up nicely for this handset so it may be worth the steep price. That triple lens camera should be the star of the show with AI smarts which may also work with the front facing camera which is a dual lens system. Both should offer impressive depth shots for great background blur effect. Expect to find a notch screen with 6.3-inch OLED display pumping out a 2880 x 1440 resolution for 538ppi. There should also be a Qualcomm Snapdragon SD845 CPU with 6GB of RAM and 64GB storage plus MicroSD expansion and a 3,300mAh battery. Expect to have more revealed at the October 3 launch event.